In this Times-Gazette file photo from March 28. 2019 Whiteoak pitcher Chase Butler throws a pitch against the North Adams Green Devils at Whiteoak High School. The Wildcats won the game by a score of 4-2. The Whiteoak Wildcats varsity Baseball team hosted their Southern Hills Athletic Conference rivals the Manchester Greyhounds and scored five runs in the bottom of the third inning to take control of the game, after falling behind 2-0 in the first, before pulling away for a 7-3 win. “Zach Harless and Chase Butler led us to victory. Zach continues to swing a clutch bat for us. 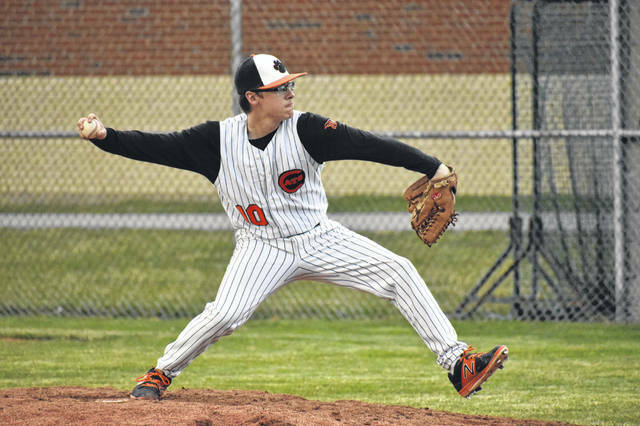 Chase was his usual reliable self on the mound displaying his “bulldog mentality” in a route going performance,” said Whiteoak Head Coach Chris Veidt. The Mustangs totaled eight hits against Clinton-Massie with Briar Bourne, Drew Pitzer and Caden Hess registering two hits apiece and Pitzer, Hess and Austin Proctor recording the Mustangs’ three runs. On Tuesday the Mustangs traveled to Ripley to take on the Blue Jays in an SHAC varsity Baseball matchup and returned home with a resounding 16-2 win. Proctor led the Mustangs with four runs and Bourne had three runs while Hess, Damin Pierson, Chase Smaltz and Alex Barber each had two. The Lady Mustangs traveled to Aberdeen for their SHAC varsity Softball matchup with the Lady Blue Jays on Tuesday and came home with a 15-4 win. Lynchburg-Clay’s ladies scored five runs in the second, three in the fourth and seven runs in the fifth to power past the Lady Blue Jays. Serah Whitacre, Serena Smith, Sierra Benney, Morgan Parks, Kylie Vastine, Aaliyah Knight, Amber DeBoard, Sam Kirby and Ashley Ernst all recorded at least one hit and one run scored in the game for the Lady Mustangs. The Mustangs varsity Baseball team was back at it on Thursday in SHAC play when they traveled to Seaman to take on the North Adams Green Devils in a conference rivalry matchup and earned a 9-1 win. Lynchburg-Clay scored six runs in the top of the seventh inning to provide the final margin of victory for the Mustangs. The Lady Mustangs also traveled to Seaman and took on the Lady Green Devils of North Adams High School and scored nine runs total in the sixth and seventh innings to come away with a 12-4 win. The Hillsboro Indians varsity Baseball team hosted the Miami Trace Panthers on Monday in a Frontier Athletic Conference rivalry matchup and took control early with a three run first inning as they cruised to a 5-1 win. Ethan Humphries got the start and the win for the Indians as he pitched all seven innings, allowed five hits and one run against four strike outs and a single walk. Humphries threw a total of 86 pitches with a 71 percent strike rate. Hillsboro was able to pick up another FAC win on Wednesday when they hosted the Chillicothe Cavaliers and used a two run sixth inning to earn a 3-2 victory. Both runs in the bottom of the sixth inning were scored via errors committed by the Chillicothe defense that allowed Grant Crum and Dylan Boone to score the deciding runs for the Indians. The McClain Tigers varsity Baseball team traveled to Chillicothe on Monday and battled FAC rivals the Cavaliers in an exciting game that saw the lead change twice over the last two innings with the Tigers earning a narrow 3-2 conference win. Colton Mossbarger and John Salyers batted in the winning runs in the top of the seventh inning for the Tigers and the defense held in the bottom of the inning to secure the win.